There’s always something new to find in collecting seated coins. Quarters, rare as they are, seem to have some of the most interesting varieties among the most common dates. 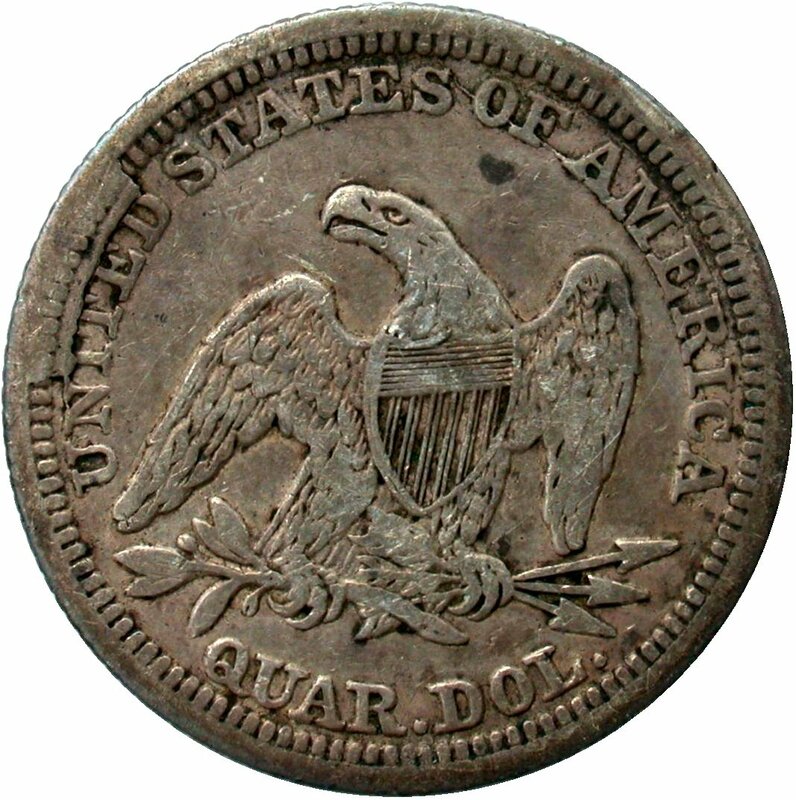 This is particularly true for the Philadelphia no motto quarters starting in 1853; as production ramped up and mass production took place for the first time, interesting and presumably unplanned things happened to the dies. Cracks, cuds, rotated dies and near mayhem ensued. The issues in 1854 and 1856 in particular have been discussed in this column before, specifically in March 2013, December 2013, and January 2014. All issues of the e-Gobrecht, for those interested, are archived at http://www.seateddimevarieties.com/LSCC.htm and all previous Quarter of the Month Columns can be found at http://www.seateddimevarieties.com/Quarter_QOM/quarterofmonth_datelist.htm. This month, at the risk of turning this into a “cud of the month” column, we have a new 1854 cud. 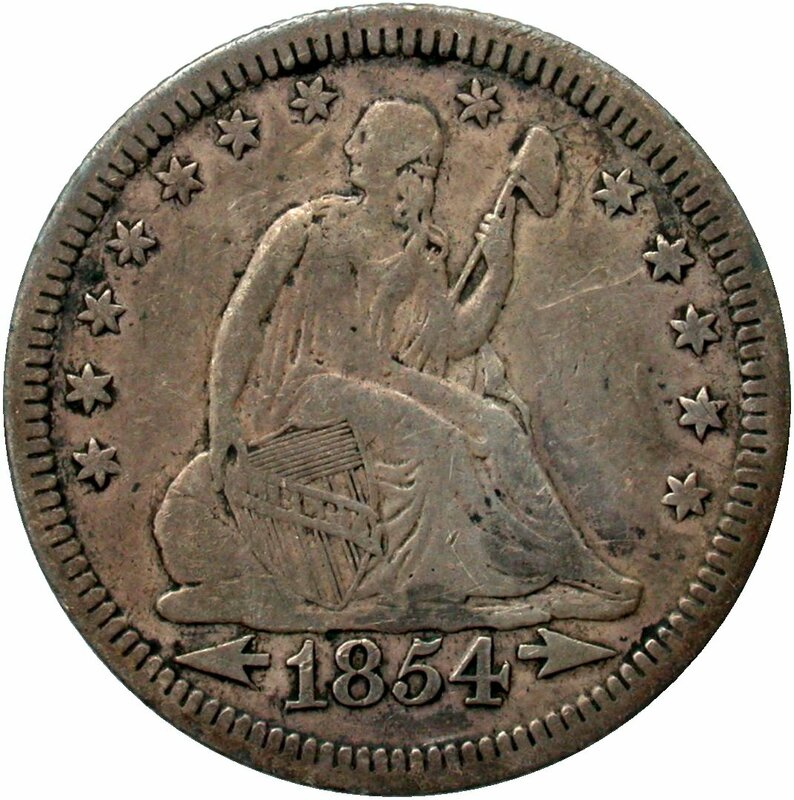 Seated coinage dealer Gerry Fortin (Rare American Coins) recently brought the coin pictured below to my attention; a previously unreported 1854 with a large reverse cud. At first glance, it appears to be the same cud as one of the 1856 reverses pictured in January of this year. Expecting to see an 1856 on the obverse, it was a bit of surprise to find 1854 instead. Though its positioning is similar to the 1856, it is very clearly a distinct die and a distinct cud. The cud is not listed in Briggs’ Comprehensive Encyclopedia of United States Liberty Seated Quarters (Lima OH 1991) and, as far as I know, has not been seen previously or reported in any subsequent Gobrecht Journals. It seems that no matter how long one looks or how much study is done, there is still more to learn and new varieties to find. So, keep an eye out for additional examples of this unique cud and especially be sure to study those common date quarters carefully.